Demonstrating acute impartiality Alexei Plutser-Sarno rigorously gathers torn and weathered street notices that are meant to engage the lowest social stratum in Russian society. He is a collector of the gestural data scrawl and the ordinary life’s chronicle. He identifies collective values and languages shared by defined social groups yet within his practice this perspicacity is a point of departure. For Plutser-Sarno a space for ideological contestation is initiated by the subject who commands language in order to both link and separate him/herself from the social whole. Moscow based Plutser-Sarno, has been collecting public street signs and bulletins since the 1980s. The collection of fascinating yet comically bleak – handwritten advertisements, love letters, obscene scrawls, missing persons, dogs, and dolls announcements, and self-made warning signs – forms Plutser-Sarno’s Museum of Ads and Announcements. Intimate messages for extended family members are interwoven with weight loss schemes, dating advice, and employment opportunities, presenting a common yet elusive discourse of signs and images. Individually each notice is unassuming yet within the assemblage of a Russian city street the messages become acts that confirm the unstructured nature of the social and the impossibility of the full colonization of daily life. The authors and readers of the notices are members of Russia’s underclass. The circulation of these messages is evidence of their everyday life. These individuals are evident through a scribbled act. A mode of public address that seems archaic and ubiquitous yet produces fluidity in communication and remains comprehensible to a specific sector of society. 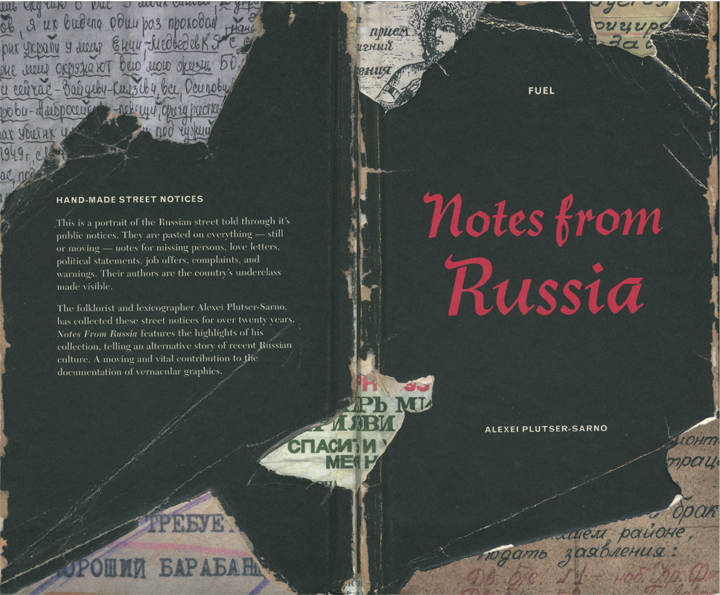 Notes from Russia is an attempt to paint a socio-psychological portrait of Russia based on anonymous street texts. 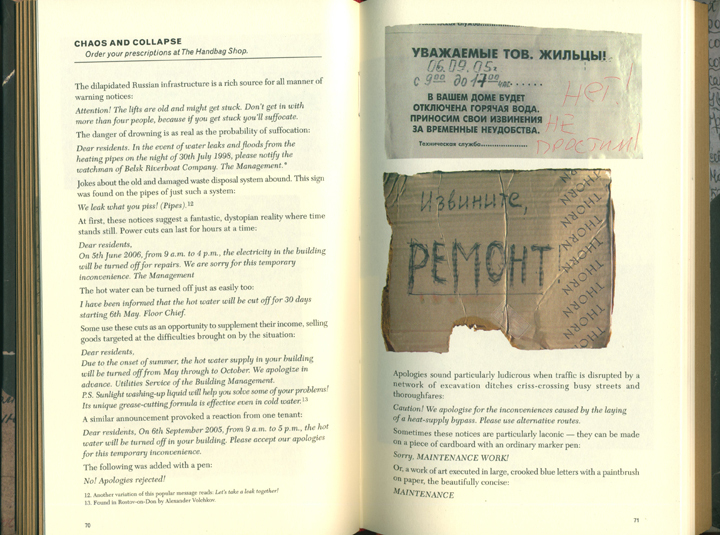 Handwritten advertisements (ads), love letters, popular announcements, obscene scrawls, self-made warning signs, and even pieces of cardboard on string worn by beggars – all help build a unique image of the country. All of these street messages are completely authentic, and are published here for the first time. Through the prism of this urban pseudo-folklore, I am trying to compose a picture of modern Russia, to describe the outlines of its social system, to determine some defining social and psychological features of its perople, and to examine the curious mythical map of the world that resides in their minds. People who post these messages and announcements on walls address a specific audience with a specific goal. At the same time, they reveal certain personal characteristics and social tendencies. They have concrete intentions: they are saying something, making explicit the state of their consciousness. Thus, these messages are social acts that originate in the sphere of so-called grey, informal social groupings and ‘illegal’ markets, which are particularly interesting in Russia. The very existence of these markets is a result of the insurmountable bureaucratic obstacles that these messages also clearly reflect. Notes from Russia is taken from my personal collection of street messages, which I call the Museum of Ads and Announcements. I first began collecting them in the 1980s. Twenty years later, Russia is still covered with these anonymous signs and scribblings, most of which are overlooked by passerby of culture, and verbal and visual trash, unsettles established cultural boundaries and definitions. I have cited texts from other collections only if they were accompanied by photographic documentation. 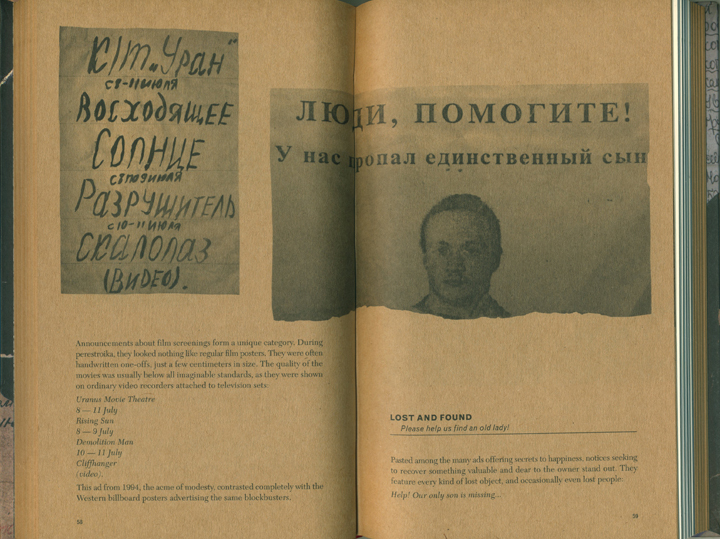 Ads marked with an asterisk, have been taken from O. Shapovalov’s Antireklama (Moscow 2001). These, then, are ‘street messages.’ A street, however, is not just text, but also a series of visual images, colors, textures, and spaces. A street is a thing which, within these pages, we are turning into a work of art. Indeed, pieces from the Museum of Ads and Announcements have been exhibited in galleries and museums across Russia. But this is their first incarnation as a book, and because of this I would like to introduce to the reader all the basic types. Voina is a revolutionary group of Russian artists that engages in radical street protest actions. Conceptions are worked out by Oleg Vorotnikov (a.k.a. “Vor” – the chief ideologist), Natalia Sokol (a.k.a. “Kozlyenok” – the chief coordinator), Leonid Nikolayev (a.k.a. Crazy Lenya) and Alexei Plutser-Sarno (the chief media artist, the author of the group’s media art and texts). The group is not supported by any of Russian curators, nor gallerists. The group doesn’t cooperate with none of the state or private institutions. More than 20 of criminal cases have been brought against the group. In 2010-2011 Vorotnikov and Nikolayev were detained in jail for 3.5 months under accusation of inciting hatred towards the police by means of their art actions. They were released from custody, as artist Banksy bailed them out. At the present moment both Vorotnikov and Sokol are wanted by the police. Voina activists have experienced dozens of arrests, searches, assaults and batteries committed by Russian cops. The latest arrest was made on October 18, 2011 when the group was filmed by the German TV journalists. «Voina Wanted» is a worldwide solidarity action by the Voina Group for the persecuted artists and group members Oleg Vorotnikov and Natalia Sokol, who were put on the international wanted list. Voina activist Alexei Plutser-Sarno & Chim Pom held the «Voina Wanted» action in Fukushima, Japan in April 2012 – a year after the nuclear plant disaster. The banner was installed in the area struck by tsunami that left almost 16000 killed and 3500 missing and swept away into the ocean. In the video you can see the places of the tragedy: lighthouse, school, gym and piles of nuclear garbage.